Halloween is just around the corner. You have received numerous invitations to Halloween parties and even your younger siblings have to go trick and treating with other kids in the neighborhood. The question lingers in your head, what should i go with this year? You don’t want to be another commoner at the party seeing 4 kinds of you at the party making you the quadruplet fairies or even the four lost Pirates of the Caribbeans. Not anymore, Halloween costume iPhone app helps you out in finding the head turning costume this year. This iPhone app offers lists of costumes from the classics e.g witch, mummy, etc., to movie and TV personalities and more. Halloween Costume Generator also features a filtering option that easily drills down specific ideas and corresponding costumes. Thus, cutting time and energy which allows you to try out the costume that you have chosen. This iPhone app is not limited only to kids, but also to men and women of all ages and sizes. 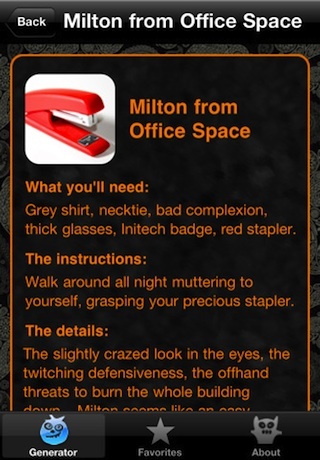 The Halloween Costume Generator iPhone app has detailed pages on a specific costumes including all the items you need. Advice on how to strut your costume and how to make yourself stay in character is also included together with a soundtrack giving you that extra boost you need when you walk your way down the street or head to that party. Since this iPhone app offers you a multitude of costumes, making it hard to decide on what costume to go with, you can use the “favorites” to track down the costumes that caught your attention and decide later on which among the list will be your best choice. The app links to Google images showing what other people have used this costume giving you an idea how to do it yourself. 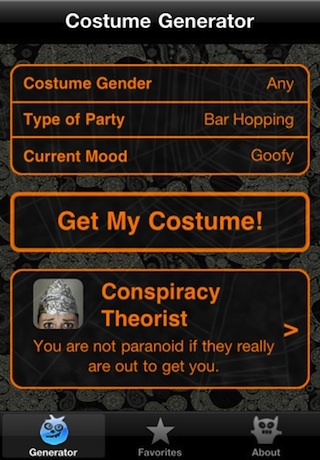 While this iPhone app won’t let you buy any specific costumes, it is a great way to brainstorm for what you might want to be for Halloween. AppSafari review of Halloween Costume Generator was written by Joe Seifi on October 24th, 2010 and categorized under App Store, Events, Fun, Reference. Page viewed 7085 times, 3 so far today. Need help on using these apps? Please read the Help Page. very nice……‘Spooky Clock’ by Zidware is a neato’ retro App for iPhone….with the famous floating ghost & beautiful clock graphics…. !